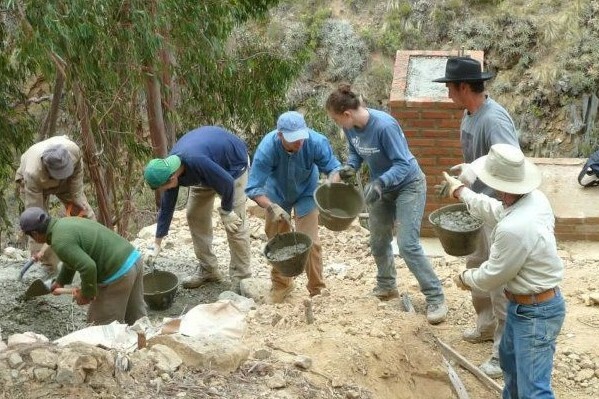 This project was a 63-meter pedestrian bridge in Cochabamba, Bolivia that was constructed by a team of 7 students. DEID formed a partnership with Bridges to Prosperity, a 501.c.3 non-profit organization that helps members of isolated communities gain access to education, health care and economic opportunity by building pedestrian bridges over impassible rivers. The municipalities Churo Bajo, Churo Alto, and Chaqui Cocha are separated by a 45-meter deep gorge that was impassible in the rainy season (from November to March) and is difficult to scale even in the dry season. Our bridge connected these communities thus granting the 108 families that reside there safe, year-round access to schools, jobs, crops, markets, and emergency medical care. This bridge is sustained throughout the rainy season and has a lifetime of at least thirty years. The bridge consisted of two concrete-block towers on either side of the gorge that was connected by high-quality wood decking suspended from recycled crane-cable.